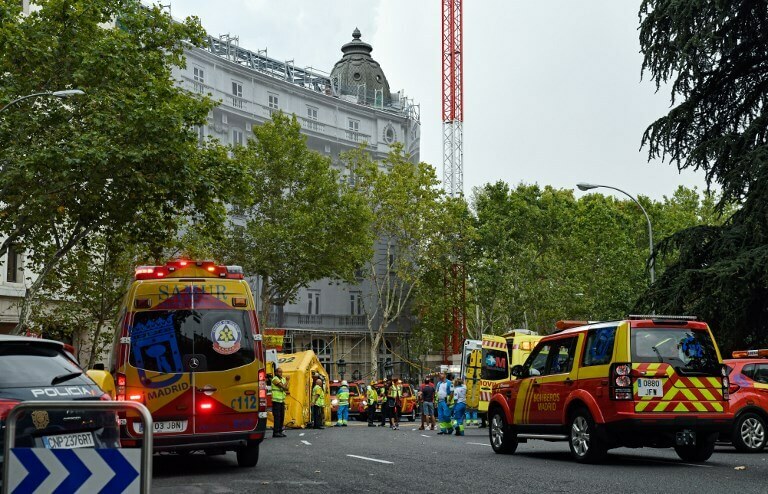 One worker died and two others were badly hurt after scaffolding collapsed during renovation work at Madrid’s Hotel Ritz Tuesday, emergency services said. ‘Final toll from the collapse of scaffolding at the Ritz: 11 people treated and one deceased,’ the city emergency services tweeted. 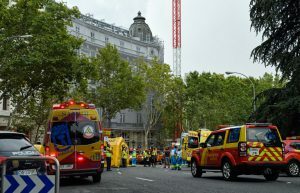 Emergency personnel and vehicles gather next to the Hotel Ritz in Madrid following an accident during remodeling works on 18 September 2018. Six people were taken to hospital and two were reported to have suffered serious injury after the scaffolding came down during the late afternoon. An emergency services spokeswoman told AFP at least three workers had to be pulled from the rubble. The luxury five-star hotel in central Madrid, opened in 1910, has been closed for several months undergoing extensive work.